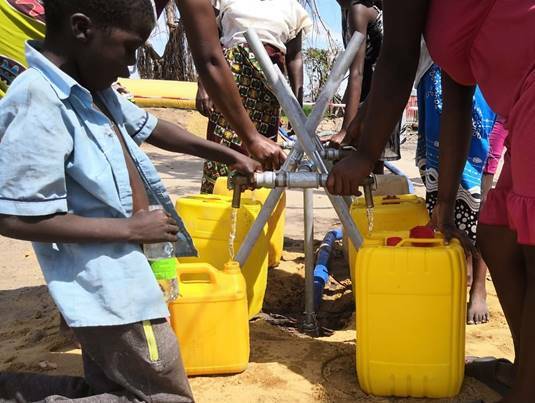 Photo: Distribution of Water in Beira, Mozambique. Photo by Guillaume Matthieu. Cyclone Idai has passed, but its impact is far from over. Mozambique has been devastated by the cyclone and now faces the added pressure of a cholera epidemic. Zimbabwe was also hit hard by Cyclone Idai and has been struggling in its aftermath. Action Against Hunger is working with local partners in both countries to provide humanitarian aid to survivors. Mozambique has experienced the worst of Cyclone Idai’s destruction. During the storm, Mozambique’s water systems were badly damaged, causing dangerous drinking water conditions that led to a massive outbreak of cholera. Cholera is an acute diarrheal infection spread by contaminated food and water, and it can be fatal if left untreated. As of April 9, Mozambique has reported 4,072 cases of cholera and seven deaths. Action Against Hunger is working with a local partner and an international aid organization to improve water and sanitation conditions in the areas most affected by Cyclone Idai. Our local partner, Kulima, works in rural areas of Mozambique to respond to emergencies and alleviate poverty. Our international partner, Aquassistance, provides sanitation, waste, and water support across the globe. We are working with these partners to distribute clean drinking water in Beira, the city hardest hit by Cyclone Idai. Over the next three months, we plan to assist more than 24,000 people with water, hygiene kits, safe latrines, hygiene promotion, and disinfection services. Additionally, as part of our Global WASH Cluster partnership with UNICEF, Action Against Hunger has provided an expert to coordinate and support WASH programs in the area. WASH assessments and programs are an emergency response technique that measures an area’s need for water supply, sanitation, and hygiene. Photo: Aquassistance water treatment stations. Photo by Guillaume Matthieu. In Zimbabwe, thousands of people need assistance. Action Against Hunger is working with two local partners, Nutrition Action Zimbabwe and Africa Ahead, to provide humanitarian aid to Cyclone Idai survivors. In our partnership with Nutrition Action Zimbabwe, we are providing survival supplies to 5,000 people, a task which we expect to complete this week. In our collaboration with Africa Ahead, we are conducting a WASH assessment and we are soon expecting to launch a WASH program in areas that have not yet been reached by aid. Photo: Action Against Hunger/Nutrition Action Zimbabwe Team preparing hygiene and emergency kits. Photo by Esther Umulisa. Action Against Hunger Canada has recently become the newest member of the Humanitarian Coalition, a group of leading aid organizations who come together during disasters to provide Canadians with a simple and effective way to help, through one joint appeal. Thanks in part to our partnership with the Coalition, we have been able to respond quickly to Cyclone Idai. Furthermore, the Canadian government is helping the Humanitarian Coalition to maximize the effectiveness of your donations. The Government of Canada will be matching all individual donations to the Humanitarian Coalition and its members until April 14, 2019, up to a maximum total amount of $2 million. For just a few more days, your gift will have double the impact for Cyclone Idai survivors. Help us respond to Cyclone Idai’s devastation. Donate now to save lives.